Finland has transformed the way it looks at waste. As the first country to publish a circular economy road map in 2016, it no longer sees waste as something with no value that needs to be disposed of. Instead, resources should be kept in use as long as possible and recovered to generate new products. This has led the country to invest in waste-to-energy plants, implement policies that require waste separation and provide financial support to those who invent solutions. However, the effort to transform waste management has not been cheap. For instance, waste-to-energy is an initiative that requires heavy investments and policies that can incentivise the public to choose this option. It also requires a high level of awareness and political will. Add to that the fact that waste is neither the most economical nor the most efficient way to produce energy. “Waste-to-energy generation plants are quite expensive for consumers. In Finland, we are planning to put some taxes on waste to make it more expensive so that recycling becomes a more affordable option for the people,” says Vantaa Energy production director Kalle Patomeri. He was speaking to Enterprise during a recent media tour on the Circular Economy and Clean Tech in Finland. In 2014, Vantaa Energy — one of the largest city energy companies in the country — built a waste-to-energy plant that uses mixed waste to provide heat for the roughly 1.5 million people living in Vantaa and Helsinki. The company is owned by the two cities. The waste comes from the nearby Ämmässuo Waste Treatment Centre, which is operated by the Helsinki Region Environmental Services Authority HSY. Mixed waste excludes biodegradable waste (biowaste), hazardous waste, electronic or electrical devices and paper. “We are burning almost 400,000 tonnes of waste per year and producing half the heat energy in Vantaa. We have several hundred kilometres of underground piping, with 80% of the houses in the city heated by this system,” says Patomeri, adding that it cost around €300 million to build the facility, which is also equipped with a gas turbine. The waste-to-energy plant has reduced 374,000 tonnes of waste that would have ended up in the landfill, according to the website of the city of Vantaa. The plant also reduced Vantaa Energy’s use of fossil fuels by 40% and carbon emissions by 30%. In the future, the company plans to retrofit another of its power plants for the use of domestic biofuels. Even then, turning waste into energy is not a long-term plan. The goal is to reduce the amount of waste produced in the first place. As Patomeri says, the cost of waste management may increase for consumers and companies in the future, thus incentivising them to either reduce the amount of waste created or invent products that can be reused or recycled. “I don’t think it will happen immediately. It takes time. For instance, my son is only 11 years old, but he is already very educated on what to do with waste. He is always complaining, ‘Please, don’t put that waste in that bin!’” says Patomeri. According to Statistics Finland, only 1% of municipal waste in 2017 was disposed at landfills, a continuation of a decade-long downward trend. Most of the waste goes into energy production or is used for material recovery. Vantaa is studying methods to clean ash, a by-product of the process. Ash is currently transported to HSY to be composted or put in landfills. Despite these initiatives, the country still does not have enough capacity to deal with all of its waste. It still exports some industrial and commercial waste to neighbouring Estonia and Sweden. According to Patomeri, a plant that is currently under construction in Finland will cut these exports by half. “After that, maybe just another smaller plant will be built. And still, we have to export some waste from Finland. My guess is that in five years, we can burn our own waste. But [this may change as] the amount of waste will go down with more recycling,” he says. Meanwhile, HSY is the other entity that serves Helsinki residents. It is in charge of waste sorting, recycling and water management. The municipal body also manages the Sortti stations, where people can drop off items that are too big for their domestic waste bins. This could be garden waste, wood and electrical or electronic equipment. “We like to call the Ämmässuo Waste Treatment Centre the eco-industrial centre because we do not want to say we are handling waste. In the circular economy, it is not waste,” says Tiila Korhonen, acting operations manager for waste handling at HSY. Ämmässuo is the largest waste treatment centre in the Nordic region, she adds. Waste that has been collected is processed for various uses. For instance, mixed waste is sent to Vantaa Energy while biowaste is composted and turned into fertiliser. Useful materials are extracted from construction waste to be reused. 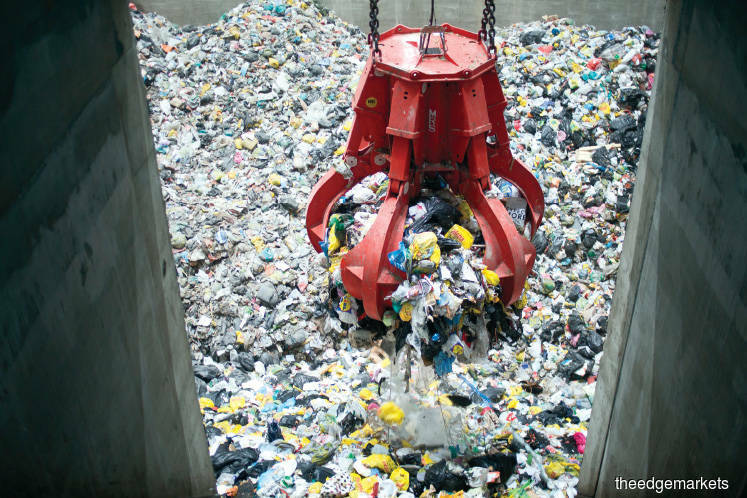 For the whole process to be efficient, separation of waste at the source is important. According to Finnish regulations, if there are more than five households in a building, the tenants have to separate plastic waste, metals, glass, biowaste, paper and mixed waste into separate bins. “The households do not get penalised for not doing source separation, but we charge them for the cost of the bins [and collection]. We have decided to make the biowaste bin much cheaper, although the handling of biowaste is actually more expensive than mixed waste. So, if you separate your biowaste, you can get a cheaper rate,” says Korhonen. With separation at the source, the biowaste is cleaner and can form better compost material, for which there is demand from the huge agricultural industry. “I know some countries that do not separate waste at the source and that kind of compost is problematic due to contamination with heavy metals and glass,” says Korhonen. Plastic bags are part of the problem. Much of the biowaste collected from grocery stores still have the packaging attached while household biowaste is often wrapped in plastic. Although there are plastic bags made from starch, the biodegrading process takes three months, which means it will remain in the plant for some time. “Our process here takes three weeks. So, the plastic bags do not have time to break down. But it is still better than normal plastic. They are elastic, thinner and easier to break open than normal plastic bags,” says Korhonen. Compared with the usual methods of dealing with waste, these processes are more expensive. According to Roni Järvensivu, another spokesman for HSY, recycling construction waste is the most economical for the company because the metal, wood and mineral fractions extracted can be reused easily. “I would say composting is the least economically viable alternative. It gives us the least amount of returns as it is much more expensive to treat compared with other kinds of waste. It requires many steps and takes a long time to complete. But we also have to consider the fact that fertiliser is very important for the community here,” he says. HSY does not get any funding from the government or municipalities. The waste and water management is paid for by the residents themselves. The company does not process commercial waste as it is handled by other entities. That means HSY needs to make sure it can get enough funding to treat all of the biowaste from households in the area. “We could use less money on investments or research. We would be able to fund waste management that way. But we will not be doing any good for society if we do not do research and invest in better facilities,” says Järvensivu. Malaysia relies largely on landfills for waste disposal. Waste separation has been mandatory in several states (Johor, Melaka, Negeri Sembilan, Pahang, Kedah and Perlis, as well as the federal territories) since September 2015. There are incinerators in locations such as Cameron Highlands, Langkawi and Pulau Tioman, although reports say some are under repair. Incinerators can turn trash into energy, gas, ash and other products. If treated properly, the gas can be released while the energy can be used to generate electricity — but only if the incinerator is equipped with such technology. Of the roughly 38,000 tonnes of waste generated daily in Malaysia, only 24% are separated to be recycled while the rest is sent to landfills, according to Deputy Housing and Local Government Minister Datuk Raja Kamarul Bahrin Shah Raja Ahmad last October. The Klang Valley is the biggest waste generator, the majority of which being food waste. The government has plans to move away from landfills to more sustainable solutions. The ministry’s goal is to increase the waste separation and recycling rate to 30% by 2020. Housing and Local Government Minister Zuraida Kamaruddin was quoted as saying in reports last July that her intention is to replace landfills with more energy efficient and eco-friendly waste management methods. This includes biomass waste management technology, waste-to-energy, incinerators and biodigesters. However, the issue of waste management is one that deeply affects local communities and evokes mixed opinions. Some argue that incinerators will cause air pollution or that the incinerator technology sourced from overseas may not work in Malaysia. Meanwhile, others find it to be a better solution than landfills. When a waste-to-energy plant was proposed to be incorporated into the Kuala Lumpur Transfer Station in Taman Beringin in 2014, it was met with objections from a group of residents, who found it too close to residential areas and were worried about the possibility of air pollution. On the other hand, Energy, Science, Technology, Environment and Climate Change Minister Yeo Bee Yin has been quoted as saying that the low levels of waste separation in Malaysia have caused an increase in the solid waste produced. Many news reports have highlighted how this could be due to low awareness among the public as well as the lack of cooperation from garbage collectors. The federal government’s plan for the waste-to-energy plant is still going ahead. Last December, the Selangor government announced its intention to partner China Western Power Industrial Co to develop a waste-to-energy system in the state. The first phase involves the launch of a waste-to-energy plant in Jeram. The plant, which is expected to be completed by 2022, will burn waste to generate electricity. It will be the biggest incinerator in Malaysia. The state government plans to spend RM1 billion on two phases of the project. Another two waste-to-energy plants are expected to be built in Selangor to process the waste produced in the state, according to Worldwide Group chief operating officer Zamri Abdul Rahman in a news report last December. Worldwide Group is wholly-owned by the Selangor government.